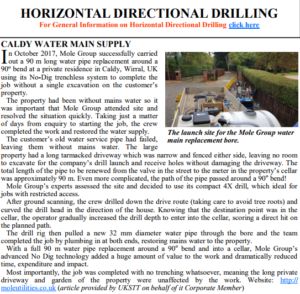 Mole Utilities’ fantastic work has again caught the attention of the world’s media – this time in international trenchless specialist magazine “Trenchless Works”. The magazine features innovative, complex and industry-leading trenchless installations from around the world, so we were delighted to be selected for inclusion in the November issue. The particular job featured was our installation of water pipes to a property in Caldy, Wirral, taking 90m of pipe around and 90 degree bend and into a cellar, with no trenching whatsoever on the property. Take a look at the case study here. Recognition at this level is a great achievement for all of our staff and highlights our expertise in this area.